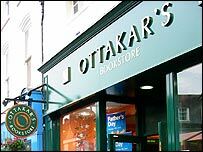 Competition watchdogs have formally cleared the way for HMV to make a new bid for bookseller Ottakar's. A tie-up, the Competition Commission said, would not lead to a "substantial lessening of competition". The commission began an investigation into the offer after independent book retailers voiced opposition to the bid. HMV - which also owns the Waterstone's book chain - launched a £96.4m offer for the firm last year, but it lapsed when it was referred to watchdogs. In March, the commission gave its provisional backing to the bid, saying a takeover was "not likely to affect book prices, range of titles offered or quality of service". Its latest report concluded that competition from online stores such as Amazon and supermarkets meant that a merger of two of the biggest names in bookselling on the High Street would have little effect on the market. Ottakar's said it welcomed the Commission's decision, however, HMV has not yet said whether it will renew its offer. Meanwhile, experts said that the delay to a deal may be to the entertainment retailer's advantage, as it will not have to pay as high a price for the bookseller. Analysts now expect HMV to make an offer of 360p a share, significantly lower than the 400p at which it made its previous bid. Earlier this month HMV Group fended off a £280m offer for its Waterstone's business from the founder of the bookshop, Tim Waterstone. It also recently rebuffed two offers from private equity group Permira - the last worth £842.7m, or 210p per share.